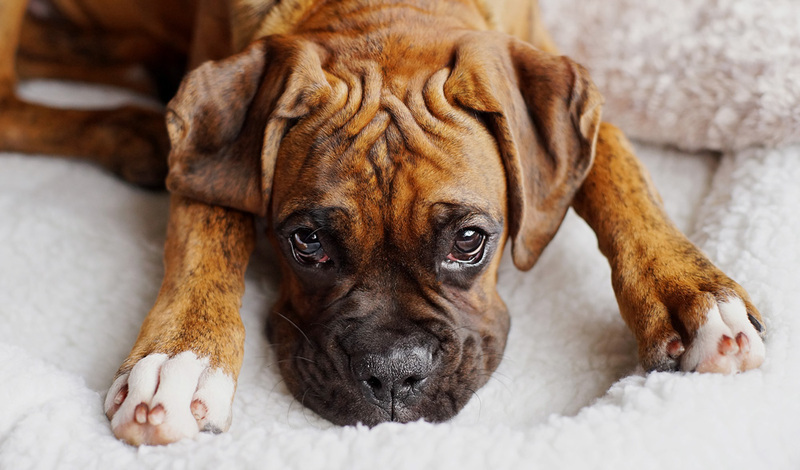 While Boxers may be the first breed to come to mind when thinking of gingival hyperplasia, other breeds such as Bulldogs, Cocker Spaniels, Collies, Great Danes, Dalmatians, and Dobermans are also predisposed to this condition. Patients with gingival hyperplasia typically present for enlarged, inflamed gums. Owners may notice pain or discomfort at home, depending on the severity of the lesions. In some cases, owners are unaware of gingival hyperplasia until it is detected during a routine veterinary exam. Gingival hyperplasia may be generalized, involving the entire mouth. In severe cases, the lesions extend all the way to the palate. In other cases, gingival hyperplasia is focal. These lesions may only affect a single tooth, or a focal area of a single tooth. Gingival hyperplasia is a proliferation of gum tissue that occurs secondary to chronic inflammation. In most cases, this chronic inflammation is triggered by the presence of dental calculus. The body responds by producing excess collagen, causing changes that lead the gum tissue to resemble scar tissue. As the gingiva becomes increasingly hyperplastic, the gingival sulcus depth increases. This leads to the formation of a periodontal pocket. As this pocket develops, increased quantities of food, debris, hair, bacteria, and other substances become trapped in it. This foreign material further contributes to inflammation, worsening the gingival hyperplasia in a vicious cycle. Gingival hyperplasia has also been associated with the use of certain medications. These medications include cyclosporine , amplodipine and other calcium channel blockers [2,3], and phenytoin derivatives . The mechanism by which these medications cause gingival hyperplasia is not fully understood, but in most cases drug-induced gingival hyperplasia resolves when the medication is discontinued. How is gingival hyperplasia diagnosed? While gingival hyperplasia is often suspected based on clinical appearance and patient signalment, true diagnosis requires histopathology. In gingival hyperplasia, the abnormal gingival proliferation is due to an increase in the number of gingival cells. This is in contrast to gingival overgrowth, in which gingival cells become enlarged without increasing in number. The gingival cells are fundamentally normal, with the exception of inflammation and potential dystrophic mineralization. Histopathology is the only way to distinguish gingival hyperplasia from other neoplastic and non-neoplastic oral proliferative diseases. In many cases, the suspicion for gingival hyperplasia is strong enough that treatment is performed concurrently with histopathology sample collection. In this case, submitting samples for histopathology confirms the diagnosis and ensures that no additional treatment is required. Whole-mouth dental radiographs should be performed on all pets receiving treatment for gingival hyperplasia. This is necessary to assess the health of the teeth and jaw. In many cases, gingival hyperplasia will mask significant dental disease that may require extractions. What treatments are available for gingival hyperplasia? Gingival hyperplasia is treated with gingivectomy, a surgical procedure in which excess gingival tissue is removed. The goal of gingivectomy is to restore the normal sulcus depth and gingival contour. A standard gingivectomy is typically considered be the fastest, easiest technique for gingivectomy. The primary limitation of standard gingivectomy, however, is that it requires the cut gingival tissues to heal by second intention. Standard gingivectomy is an excellent option for patients with small areas of gingival hyperplasia. In dogs with widespread gingival hyperplasia, however, it leaves a large amount of exposed tissue that must heal before dental home care can be started, leading to increased blood loss and pain. Alternatives exist for these patients. 1. Measure the periodontal pockets at multiple areas in the region that is to be addressed. Ideally, you want to leave a 3 mm periodontal pocket post-gingivectomy. Approximately 1 mm of that will recede as tissues heal, leaving a functional 2 mm periodontal pocket. Nick the gum with a scalpel blade or needle at the 3 mm mark, to guide your incision, and do this at multiple sites in the area to be treated. This will create a “dotted line” along which to remove excessive gum tissue. 2. Use a scalpel blade, knife, or radiosurgery unit to cut away excess gingival tissue to the level determined by your measurements. You can create a single incision that involves the gingiva of multiple teeth, or create a separate incision around each tooth. The incision should be made at a 45-degree angle to the tooth’s root surface. If radiosurgery is used for this step, care must be taken to avoid thermal injury to the teeth and bone. 3. Scale and polish the newly exposed tooth surfaces. 4. 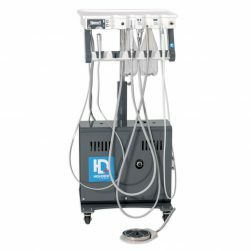 Use a water-cooled high-speed handpiece with tapered diamond or finishing burs to smooth the gum contours as needed. 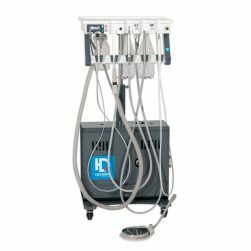 Quality veterinary dental units allow greater control and precision, thus minimizing the risk of injury. 5. Control bleeding by applying pressure with moistened gauze. A surgical flap gingivectomy technique has also been described . This technique may be considered for patients with widespread gingival hyperplasia. Instead of leaving a large area that must heal by second intention, this uses a flap to cover the debrided tissue. The technique for a periodontal flap gingivectomy is similar to the use of a periodontal flap for dental extractions. Measure and mark the desired level of gum tissue, as described above. Use a scalpel blade to create a beveled incision at this level, as described above. Elevate a flap. Use a scalpel blade to remove excessive gingival tissue from around the teeth. Scale and polish the newly exposed tooth surfaces. Replace the flap and close with suture. While this technique is utilized less commonly than standard gingivectomy, it may prove beneficial in some cases. Gingivectomy is a painful procedure, regardless of the technique that is used. It is important to use balanced anesthesia and analgesia protocols (including nerve blocks) and send patients home with continued pain medication, such as NSAIDs and/or opioids. Patients should be fed a soft diet for 2 weeks after surgery, to minimize trauma to the healing gums. Owners should also avoid chew toys and hard treats during this time. Once the gums are fully healed, the focus must shift to preventing recurrence. Daily home care is essential to control dental calculus, reduce oral inflammation, and reduce the likelihood of recurrence. Owners should brush their dog’s teeth daily starting at two weeks post-operatively. Antimicrobial oral hygiene rinses may also be beneficial. Pets should receive continue to receive regular oral health examinations and dental cleanings for the remainder of their lifetime, in order to monitor dental health and remove accumulating dental calculus. Gingival hyperplasia is a commonly-encountered problem in veterinary practice. Understanding the etiology, diagnosis, and treatment of gingival hyperplasia can improve treatment success, alleviating discomfort and increasing quality of life for your patients. 1. Seibel, W, Yahia, NA, McCleary, LB, Lesko, LJ, Hassell, TM. 1989. Cyclosporine-induced gingival overgrowth in beagle dogs. J Oral Pathol Med. April;18(4):240-5. 2. Thomason, JD, Fallaw, TL, Carmichael, KP, Radlinsky, MA, Calvert, CA. 2009. Gingival hyperplasia associated with the administration of amlodipine to dogs with degenerative valvular disease (2004-2008). J Vet Intern Med. Jan-Feb;23(1):39-42. 3. Waner, T, Nyska, A. 1991. Gingival Hyperplasia in Dogs. Compend Contin Educ Vet. 13(8):1207-1213. 4. Niemec, B. 2017. Treatment of Gingival Hyperplasia in Dogs. Presented at World Small Animal Veterinary Congress.